Valerian is a medicinal herb that thrives in damp woods and along rivers. The root of the valerian plant is dried and ground into powder for use in medicinal treatments, often to ease sleeplessness, says Medicinal Herb Info. 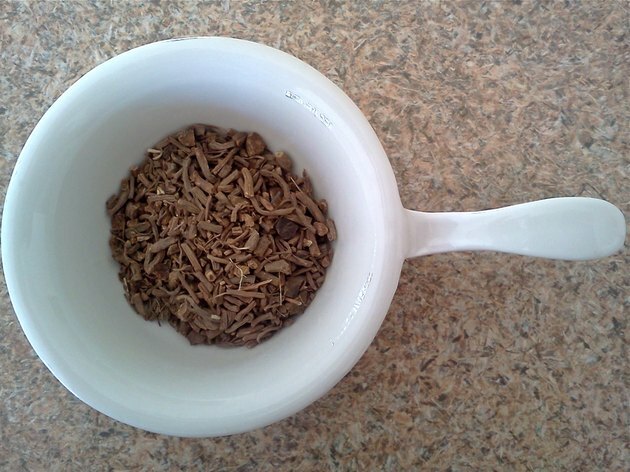 Before you start to take valerian root, consult your health care provider. Valerian root has long been used as a treatment for insomnia, anxiety disorder and depression, says the U.S. National Library of Medicine (USNLM). The National Center for Complementary & Alternative Medicine (NCCAM) adds that it is used to treat headaches, irregular heartbeat and spasms as well. It’s been found to have fewer side effects than many of the prescription medications for these conditions. A report by the University of Maryland Medical Center (UMMC) showed that when used to treat insomnia, valerian increased in effectiveness over time and had fewer side effects than prescription medications. For the first 28 days it was taken, however, it seemed to have little effect. The NCCAM is currently funding research on the effects of valerian for sleep, Parkinson’s disease and menopausal symptoms as well as its possible toxic effects on the liver. Valerian can cause mild upset stomach, headaches, dizziness and tiredness, says the NCCAM. The MSKCC also cautions that valerian has been shown to cause liver toxicity when used over the long term. Short-term use is considered to be generally safe. The USNLM warns that there has been evidence of liver toxicity from multi-herb preparations containing valerian; it’s unclear if the valerian or the other herbs caused the toxicity. USNLM reports that some people may experience an allergic reaction to valerian and it is not recommended for use by pregnant or breast-feeding women. According to the MSKCC site, valerian root may harmfully interact with other herbs or supplements that are metabolized by the liver, such as or vasopressin. Valerian inhibits liver enzymes such as cytochrome P450 (CYP) 2D6 and CYP3A4 and may interfere with medications metabolized by them. The USNLM reports that it can also increase the effects of other medications such as Imodium or Valium as well as herbs such as St. John’s Wort. The site cautions people who take antidepressants or seizure medications, or drink alcohol, to avoid taking valerian. The UMMC adds that if you are taking antihistamines, cholesterol lowering drugs or anti-fungal medications you should not take valerian. Valerian is commonly used in juice form or as freeze-dried powder that is available as capsules, tablets, teas or extracts, according to the UMMC. Consult your health care provider for dosing and instructions to avoid toxicity.